A team of British and Canadian researchers has managed to successfully sequence the full genome of a living organism using a machine the size of a smartphone called the MinION. The miniaturisation breakthrough could allow for more personalised medical diagnosis and better research in the field. 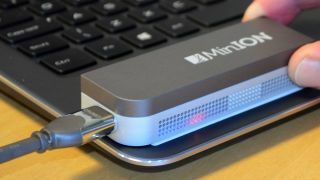 The MinION was developed by Oxford Nanopore Technologies and is currently undergoing tests to evaluate the technology. Its tiny size and relatively low cost could allow scientists to perform much more advanced analysis away from a lab. "The amazing thing about this device is that it is many times smaller than a normal sequencer - you just attach it to a laptop using a USB cable," explained Jared Simpson, a lead author on the study. "It's amazing," added Luiz Shozo Ozaki from the Centre For The Study Of Biological Complexity, who plans to use the handheld device to study mosquitoes that transmit malaria and other diseases in the Amazon. "It's something I can put in my pocket, take into the rainforest and get a genetic sequence right there." The drawbacks identified so far revolve around accuracy - the data it produces is currently less accurate than the data produced by a larger machine, meaning that strong bioinformatics tools are needed to correct errors. That was the focus of Simpson's paper: "We were able to mathematically model nanopore sequencing and develop ways to reconstruct complete genomes off this tiny sequencer," he said. Once proven, it's hoped that the device could be used to sequence tumour genomes, giving the option of more personalised diagnosis and treatment to cancer patients. "It's not ready for prime time yet, but it is producing a lot of data," said Gregory Buck, also from the Centre For The Study Of Biological Complexity. "We want to see it work, and we're optimistic that it's going to work."